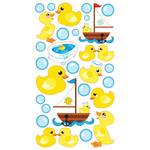 Jolees-Boutique Dimensional Stickers: Baby Rattle. Make your papercrafting project pop with these unique embellishments! Great for decorating cards, pages and more. This package contains eleven dimensional stickers on one 4x3-3/4 inch backing sheet. Imported.